In saucepan place broth and uncooked potatoes. Over high heat, heat to a boil. Cover and cook over medium heat 10 minutes or until potatoes are tender. Drain, reserving broth. Mash potatoes with 1 1/4 cups broth and pepper. If needed, add additional broth until potatoes are desired consistency. 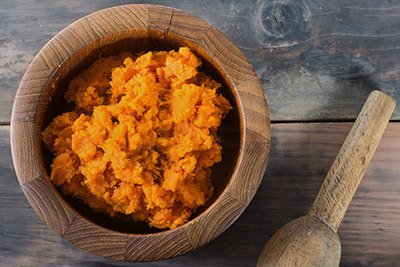 Use only 4 large sweet potatoes and add 2 tablespoons brown sugar after potatoes have been mashed.